The New York Coastal Management Program, established in 1982, is housed within the New York Department of State’s Office of Planning, Development, and Community Infrastructure. Much of the program’s legislative authority is drawn from the state Waterfront Revitalization of Coastal Areas and Inland Waterways law as well as the Coastal Erosion Hazard Areas law. The program pursues goals related to coastal resources protection and development, local waterfront revitalization, coordination of major activities affecting coastal resources, public awareness of coastal issues, and federal consistency with state coastal management policies. 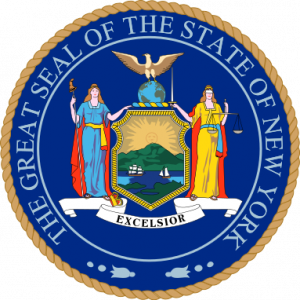 Within New York, the Department of State administers the program and coordinates its implementation in cooperation with the state Department of Environmental Conservation as well as other state agencies. Coastal program boundaries extend along the coast of Long Island, New York City, Hudson River estuary, both Great Lakes that border New York, and the Niagara River. Specific landward boundaries of the coastal program vary by region and locality due to initial delineation proposals from local government agencies. All barrier and coastal islands on Long Island are included within program boundaries along with areas 1,000 feet landward of the shoreline, extending further in some cases. The New York City program boundary generally extends 500 to 1,000 feet inland from the shoreline, with select areas along major tributaries also extending further. Within the Hudson River Valley the landward boundary is generally 1,000 feet but may extend up to 10,000 feet in areas that possess high aesthetic, agricultural, or recreational value. In the Great Lakes region the boundary is also generally 1,000 feet, though urbanized areas or transportation infrastructure parallel to shore limit the boundary to 500 feet or less in some cases. Coastal management program consistency reviews require federal actions in the state coastal zone to be consistent with the enforceable policies of the state program or the policies of an approved local waterfront revitalization program. The program also contains provisions to ensure consistency of state actions in coastal areas. Of the 44 coastal management program enforceable policies in New York, seven specifically address flooding and erosion hazards. These policies touch on a number of aspects of coastal flood risk management including the siting of buildings in coastal areas to minimize risk to property and human lives, protection of natural features that mitigate coastal flood risk, construction of erosion control structures to to meet long-term needs, prevention of flood level increases due to coastal activities or development, prevention of coastal mining or dredging from interfering with natural coastal processes, use of public funds for erosion protection structures, and use of non-structural mitigation measures when possible. Additional enforceable policies address coastal development, fish and wildlife resources, public access, recreation, historic and scenic resources, agricultural lands, energy and ice management, water and air resources, and wetlands management. At the state level, aspects of New York’s Environmental Conservation Law, Local Waterfront Revitalization Program, and State Environmental Quality Review permitting program influence coastal zoning and development decisions. Article 34 of the Environmental Conservation Law requires the identification of coastal erosion hazard areas and rates of recession of coastal lands. Shoreline setbacks must then be implemented at a distance that is sufficient to minimize damage from erosion. Article 36 of the Environmental Conservation Law, the state Flood Plain Management Act, also addresses coastal hazards, requiring walled and roofed buildings to be sited landward of mean high tide and prohibiting mobile homes within coastal high hazard areas, among other restrictions. Article 15, Water Resources Law, regulates the placement of coastal structures such as docks or piers and also addresses the placement of fill in coastal areas. Together these elements of the Environmental Conservation Law provide much of the legal basis for zoning decisions that can affect coastal flood risk at the municipal and local level. Participation in the Local Waterfront Revitalization Program can also influence a local government’s coastal zoning decisions. In the process of preparing and adopting a revitalization program, local governments provide a more specific implementation of the state Coastal Management Program, taking advantage of local regulatory powers such as zoning ordinances and site plan review. Upon approval of a Local Waterfront Revitalization Program, state actions must then be consistent with the local program. In this way the enforceable policies of the Coastal Management Program, including those that relate to coastal flooding and erosion, are incorporated into local zoning decisions. Elements of enforceable policies are also incorporated into environmental permitting through the State Environmental Quality Review Program, which requires state agencies and local governments to prepare an environmental impact statement for any action that may have a significant impact on the environment. If an action in a coastal area requires the preparation of an impact statement, it must also be determined that the action is consistent with any relevant coastal enforceable policies. Consistency reviews must also be applied to NYS SEQRA type 1 actions as well as unlisted actions. Floodplain management activities within New York are primarily conducted through the National Flood Insurance Program. Any regulations developed by the state must be at a minimum as strict as those prescribed by FEMA. Beyond the state level communities may adopt more restrictive floodplain management regulations. Within the state, local communities largely regulate development within federally designated Special Flood Hazard Areas, with state assistance provided by the New York State Department of Environmental Conservation. Local development permits govern private development within floodplains as well as development by a county, city, town, village, school district, or public improvement district, as specified in the state Environmental Conservation Law. State standards for floodplain development permits in all designated special flood hazard areas require adequate anchorage and use of flood resistant material for all new construction and substantial improvement to existing structures. Utilities must also be designed in a manner that minimizes or eliminates risk of damage or failure during flood events. In areas where base flood elevation data exists, new construction or substantially improved residential structures must have the lowest floor at two feet above the BFE, including basements and cellars. Nonresidential structures may employ floodproofing to provide protection. Any enclosed areas below the base flood elevation must be designed to allow for the equalization of hydrostatic forces on exterior walls during a flood event. If no base flood elevation has been determined, new construction or substantially improved residential structures must be elevated above grade to the depth specified on the corresponding flood insurance rate map or two feet if no number is specified, with nonresidential structures again able to employ floodproofing measures. All state agency activities, whether directly undertaken, funded, or approved by an agency, must also be evaluated in terms of significant environmental impacts under the State Environmental Quality Review program, which includes a substantial increase in flooding as a criteria of significance. An environmental impact statement must be prepared if it is determined that an action may have a potential significant adverse impact. All structures must be located landward of mean high tide levels within coastal high hazard areas, and all new construction or substantially improved structures must be elevated on pilings or columns so that the bottom of the lowest horizontal structural member of the lowest flood is elevated to or above the BFE. Pilings or column foundations must be adequately anchored, and fill is prohibited for use as a structural support for any new structure or substantial improvement. Space below the lowest floor may not contain obstructions to flood flows or otherwise be enclosed with non-breakaway walls. Any such space below the lowest structural floor may not be used for human habitation. New development or substantial improvement to structures must also not affect sand dunes in any way that increases potential flood damages. The New York State Department of Environmental Conservation is also responsible for wetland management within the state. Statutory authority for wetland regulations stems from the Tidal Wetlands Act and Freshwater Wetlands Act, part of the larger state Environmental Conservation Law. Wetlands and wetland regulations are divided into either tidal or freshwater, and wetlands are further classified within each category. State wetland inventories containing information on delineated areas and classifications are made available for public use as part of the state wetland mapping program. Activities within wetland areas are regulated through a permit system. Tidal wetlands regulations are designed to allow uses of wetlands that are compatible with the preservation, protection, and enhancement of ecological values including flood protection and storm control. Development restrictions require that all buildings and structures in excess of 100 square feet be located a minimum of 75 feet landward from tidal wetland edges, with less stringent setbacks in place for buildings located within New York City. Similar setback requirements exist for impervious surfaces exceeding 500 square feet. On-site sewage systems must have a setback of at least 100 feet, and a minimum of two feet of soil must be between the bottom of a system and the seasonal high groundwater level. Permit standards for activities within tidal wetlands require that any proposed activity be compatible with the overall state policy of preserving and protecting tidal wetlands, and as such any activity may not cause any undue adverse impact on the ecological value of an affected wetland area or any adjoining areas. Standards also require that any activity within tidal wetlands be compatible with public health and welfare, be reasonable and necessary, and take into account both alternative actions and the necessity of water access or dependence for the proposed action. The state also publishes compatible use guidelines for activities within wetlands based on wetland type. If any activity is presumed to be incompatible with state tidal wetland use guidelines, an applicant must overcome the presumption of incompatible use and demonstrate that the activity is compatible with the preservation, protection, and enhancement of wetland values. If a use is specifically listed as incompatible within guidelines the use is then prohibited. Permitted activities in areas adjacent to tidal wetlands must also be compatible with public health and welfare, have no undue adverse impact on wetland ecological values, and comply with use guidelines. State flood-resistant construction requirements are listed in the International Residential Code as adopted by New York State. Regulations apply to new residential buildings and structures located fully or partially within flood hazard areas as well as any substantially improved or restored structures within flood hazard areas. Construction requirements are based on the design flood elevation, which at a minimum must be the higher of either the peak elevation of a 1% annual chance flood event or the elevation of the design flood event as adopted on community flood hazard maps. Structures within flood hazard areas must generally be designed and anchored to resist the flood forces associated with the design flood elevation, and methods and practices to minimize flood damage must also be employed. For the purposes of determining appropriate structural elevations, the lowest floor of a structure is defined as the lowest floor of any enclosed area, including basements. Within flood hazard areas not subject to high-velocity wave action, structures must have the lowest floor elevated to two feet above the base flood elevation or design flood elevation, whichever is higher. Utility systems must also be elevated to this standard. If no depth number is specified structures must be elevated not less than three feet above the highest adjacent grade. Any enclosed area below the design flood elevation must be used only for building access, parking, or storage and must contain flood openings sufficient to equalize hydrostatic forces on exterior walls. For buildings and structures located in coastal high-hazard areas, including both V zones and Coastal A zones, the lowest floor must be elevated so that the lowest horizontal structural members are elevated to either the base flood elevation plus two feet or the design flood elevation, whichever is higher. Any walls below the design flood elevation must be designed to break away without causing damage to the elevated portion of the building, and again may be used only for parking, building access, or storage. Structures must be elevated using adequately anchored pilings or columns, with select exceptions in Coastal A zones. The use of fill for structural support and any construction of basement floors below grade are prohibited. New buildings and any substantially improved structures in coastal high-hazard areas must be located landward of the mean high tide, and any alteration of sand dunes must not result in any increased potential for flood damage in surrounding areas. Planning at the state level is guided by the State Smart Growth Public Infrastructure Policy Act, an article within the larger Environmental Conservation Law. The act outlines criteria for public infrastructure projects that are either approved, directly undertaken, or financed by state infrastructure agencies. Among these criteria is a requirement that future public infrastructure projects mitigate future climate risk due to sea level rise, storm surge, or flood events based on available data or predictions of future extreme weather conditions. This and other criteria must be met to a practicable extent, and if deemed impracticable an agency must provide a detailed statement of justification. The Office of Planning, Development, and Community Infrastructure within the Department of State administers several programs involved in community planning. The New York Rising Community Reconstruction Program provides recovery and resiliency planning assistance to communities affected by severe storm events, including hurricanes Sandy and Irene. The program is operated through the Governor’s Office of Storm Recovery and involves collaborations between state teams and community members to develop reconstruction plans and strategies to increase physical, economic, and social resilience, often including elements related to mitigating future flood risk. State Waterfront Revitalization Programs are also involved in community redevelopment planning. These programs establish land and water use policies and identify revitalization projects at a local level to allow for sustainable use of coastal resources, including planning for coastal flood risk resilience. Local Waterfront Revitalization Programs can also be a conduit for technical assistance and grant funding to facilitate climate change adaptation through the New York State Environmental Protection Fund grant program, a permanent fund addressing a broad range of environmental and community development needs. The majority of stormwater regulations in New York focus on water quality issues as part of the State Pollutant Discharge Elimination System, a state program that has been approved by the EPA as part of the National Pollutant Discharge Elimination System. The program regulates point source discharges to both groundwater and surface waters and also conducts permitting for stormwater runoff from industrial activities, municipal sewer systems in urbanized areas, and construction activities. The program is administered by the state Department of Environmental Conservation. While water quality is the focus of stormwater programs within the state, the state stormwater design manual lists best practices that include measures to reduce overbank flooding in order to maintain pre-development peak discharge rates for two and ten-year frequency storm events following development. The design manual also addresses risks due to potential floodplain expansion following development as well as green infrastructure strategies. These green infrastructure strategies are presented as a means to meet runoff reduction standards, which require that post-development conditions replicate pre-development hydrology. Stormwater projects, like all activities undertaken, funded, or approved by state agencies, are also under the purview of the State Environmental Quality Review Act, which requires preparation of an environmental impact statement if a project is likely to cause a significant increase in flood risk. Coastal erosion in New York is managed within designated coastal erosion hazard areas. Areas are designated as per requirements of the state Coastal Erosion Hazard Areas Act, part of the larger state Environmental Conservation Law. Regulatory programs within identified hazard areas are administered by the state Department of Environmental Conservation. Programs may also be established at a local level if minimum state standards and criteria are met. The objectives of the program, as outlined in the state administrative code, are to ensure that activities in coastal areas subject to flooding minimize or prevent damage to property and natural features, that structures are placed at a safe distance from hazard areas to prevent premature damage to both structures and natural features, that public investment likely to encourage development within erosion hazard areas is restricted, and that publicly financed structures are only used when necessary and effective. Sections of the state administrative code also describe the erosion protection functions of natural protective features in order to guide the review of permit applications. Coastal erosion management permits are required for any regulated activity conducted within a designated coastal erosion hazard area. Coastal erosion management permit standards require that any proposed activity be reasonable and necessary, with consideration of proposed alternatives, and that an activity will not likely lead to a measurable increase in erosion at the proposed site or other locations. Standards also require activities to prevent or minimize adverse effects to natural protective features, existing erosion protection structures, or natural resources such as fish and wildlife habitat. Regulations within structural hazard areas allow for placement of movable structures, with construction restrictions, if a permit has been granted. Construction or placement of nonmovable structures is prohibited. Any public utility systems within structural hazard areas also require a coastal erosion management permit. Additional restrictions on regulated activities are present within natural protective feature areas, including nearshore areas, beaches, bluffs, primary dunes, and secondary dunes. Construction of erosion protection structures is allowed within such areas provided the structure meets permitting requirements and is designed to prevent or minimize damage to property and natural features in a cost-effective manner. Structures must be designed to control erosion on site for a minimum of 30 years. New York has put forth several climate adaptation measures at the state level, led primarily by the state Department of Environmental Conservation. Sea-level rise projections for threatened coastal areas are currently published within the state administrative code, a recommendation from the previously convened NYS Sea Level Rise Task Force. The projections formally establish sea-level rise levels throughout Long Island, New York City, and the Hudson River, providing information based on five risk scenarios and extending out to 2100. The Department of Environmental Conservation has also formally acknowledged its role in climate change adaptation through Commissioner’s Policy 49: Climate Change and DEC Action. The policy outlines methods by which climate change considerations may be integrated into current DEC activities and programs, including making greenhouse gas reductions a primary goal, creating specific mitigation objectives for existing and future programs, incorporating adaptation strategies into programs and activities, considering climate change implications in daily department activities, and identifying specific actions to further climate change goals and objectives as part of annual planning processes. The policy goes on to establish mitigation and adaptation objectives as well as departmental responsibilities and implementation procedures. The 2014 Community Risk and Resiliency Act (CRRA) forms the basis for a number of climate adaptation initiatives within New York from a legislative standpoint. The previously mentioned sea-level rise projections were a product of the CRRA, as the act amended the state Environmental Conservation Law to include a requirement that the DEC adopt science-based projections. The CRRA also amended additional sections of the Environmental Conservation Law to require applicants for identified funding and permitting programs to demonstrate that risk due to sea-level rise, storm surge, and flooding have been considered in project design and requires the DEC to incorporate similar considerations into facility-siting regulations. The sea-level rise, storm surge, and flood risk mitigation components of the Smart Growth Public Infrastructure Policy Act are also tied to the CRRA. The CRRA also directs the Department of State and Department of Conservation to develop model local laws that consider data-based future risk due to sea-level rise, storm surge, and flooding as well as guidance on the use of natural resources and natural processes to enhance community resilience to such hazards. State management capacity is bolstered by the New York Coastal Management Program’s federal consistency review process, which requires that federal activities within the state coastal zone be consistent with the program’s enforceable policies. The New York program has 44 enforceable policies in total, with 7 specifically addressing flood and erosion hazards. Local governments can implement the state Coastal Management Program at a smaller scale through the Local Waterfront Revitalization Program, extending the influence of state program goals and enforceable policies. The enforceable policies of the state coastal management program address the protection of natural features that mitigate coastal flood risk and the use of non-structural mitigation measures where feasible. Shoreline setbacks must be established within identified coastal erosion hazard areas, and setbacks must be at a distance sufficient to minimize damage from erosion considering the rate of recession of coastal lands. Floodplain management regulations require that any new development or substantial improvement to structures in coastal areas not affect sand dunes in any way that might increase potential flood damages. Wetland management regulations require that structures be located a minimum of 75 feet landward from the edges of tidal wetlands, preserving natural flood risk mitigation functions. Sections of the state administrative code related to erosion management include descriptions of the erosion protection functions of natural features to guide permit applications, and permit standards require that erosion management activities prevent or minimize adverse impacts on natural protective features. The state stormwater management design manual includes information on green infrastructure strategies, which are presented as a means to meet runoff reduction standards and maintain pre-development hydrology for project areas. The state building code requires structures not subject to wave action to have the lowest floor elevated a minimum of one foot above the base flood elevation. This rule applies to the lowest horizontal structural members of structures that are subject to wave action. State regulations require that erosion protection structures in coastal areas be designed to control erosion on site for a minimum of 30 years. Public infrastructure projects approved, undertaken, or financed by state agencies must account for and mitigate risk due to future climate risk factors such as sea-level rise, storm surge, and flood events. Mitigation efforts must be based on available data as well as projections of future conditions. The state has published sea-level rise projections for threatened coastal areas within the state administrative code, formally establishing risk based on five scenarios and extending to 2100. Commissioner’s Policy 49: Climate Change and DEC Action identifies ways that climate change considerations could be incorporated into current state programs and activities and defines departmental responsibilities and procedures for implementing the climate adaptation goals of the policy. The state Community Risk and Resiliency Act formally establishes a number of climate adaptation initiatives within the state, including the requirement that the state Department of Environmental Conservation adopt science-based sea-level rise projections and that applicants to funding and permitting programs demonstrate that climate risk has been incorporated into the siting of facilities. The enforceable policies of the state coastal management program address the siting of buildings in coastal areas to reduce risk and well as restrictions on the use of public funds for erosion protection structures. One of the objectives of the state erosion management program as described in the state administrative code is to restrict public investment that could encourage development within coastal erosion hazard areas. An additional objective is to use publicly financed erosion control structures only when necessary and effective. The New York Rising Community Reconstruction program works to develop reconstruction plans and strategies to increase coastal community resilience following severe storm events, often involving the mitigation of future flood risk. The New York Coastal Management Program lists coordination of major activities affecting coastal resources as one of the program goals, and multiple state agencies are involved in implementing the program’s broad suite of enforceable policies. If an action requires preparation of an environmental impact statement as part of the State Environmental Quality Review Program it must also be consistent with the enforceable policies of the state coastal program, including policies related to coastal hazards. State wetland regulations are based on the preservation, protection, and enhancement of ecological values as opposed to acreage, with flood control and storm protection listed among the functions provided. The State Environmental Quality Review Program includes the potential for a substantial increase in flooding as a criteria of significance, which then triggers the preparation on an environmental impact statement for state agency activities. State Waterfront Revitalization Programs establish land and water use policies that incorporate coastal resilience into revitalization projects and community redevelopment planning.